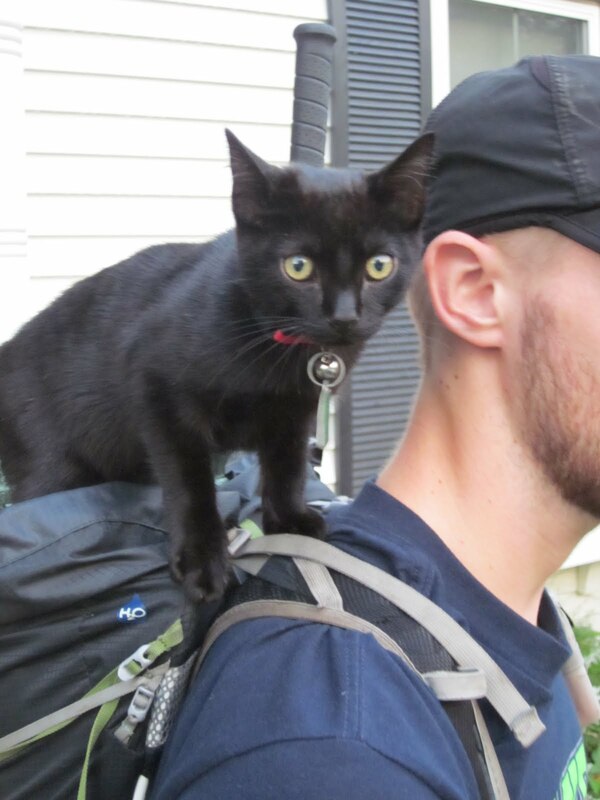 How do you hike the Appalachian Trail with a cat? That question has come up recently following a post about “trail angels” who took in AT thru-hikers during Tropical Storm Irene. During their stay with him and in communication since they’ve returned to the trail, Greg Cook learned some of Magic Mix and Sir’s story. 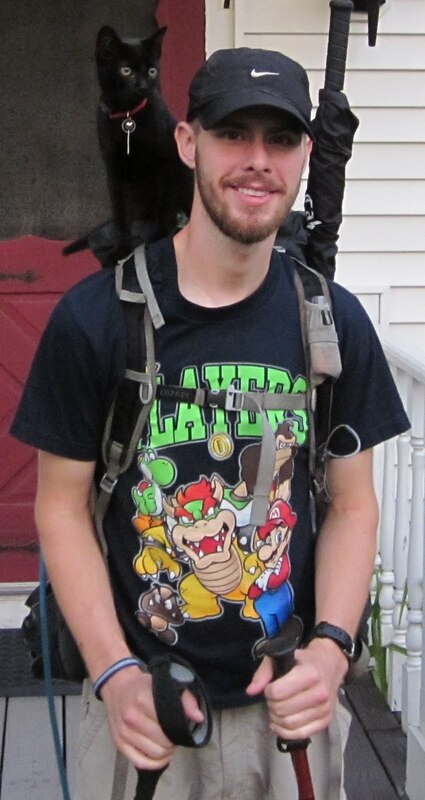 Magic Mix decided to hike the Appalachian Trail after serving five years in the Marines. He started in Georgia alone, but before long yearned for companionship on the trail. At an early trail town, he got online and onto Craiglist, where he found a silky black kitten he promptly named Sir. Magic Mix stayed in town an extra day to get Sir checked out by a veterinarian. At not even a month old, Sir was young to leave his mother. Maybe this made the kitten cling more tightly to Magic Mix, or maybe being together nearly every minute of every day did it, but by the time the feline and the human reached New Hampshire, they’d developed an unusually strong bond. Sir spent most of his time sitting on his backpack cushion; when he wanted to get down, he nudged Magic Mix with his nose or a paw. They carried some dry food for Sir, but mostly he caught his own — mice and beetles at campsites. The first afternoon they stayed with Cook, Magic Mix went into town without Sir and left his pack on Cook’s back porch; the cat waited patiently in his usual spot for his companion’s return. Cook recently heard from Magic Mix’s mother. 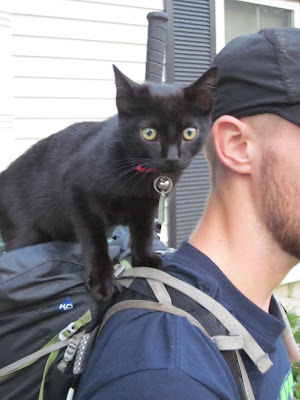 The young man and the cat were in Gorham, N.H., hoping to catch a ride to Mount Katahdin, the trail’s end, in Maine. From there, they’d flip-flop, hike back south along the trail, taking advantage of a few extra weeks’ good weather, and complete the trail in New Hampshire. There was every chance, though, that they’d run out of hiking season altogether and be forced to finish the trail another year. It was a change from Magic Mix’s earlier single-minded focus on completing the AT in a single season. “At the beginning of the trip I’d hike in extreme heat and rain,” he wrote his mother in an email. But now that he had Sir, he didn’t want to subject the cat to such weather. He’d also needed to leave the trail for vet visits and to get the cat neutered. The weather, “which refuses to give us more than three decent hiking days in a row,” had also added to the “forced zero” mileage days. - Read "Trail Angels shelter AT thru-hikers during Irene".